Award-winning toy figure maker Day2Day Trading has just sent us these impressive shots of their new Dan Dare prototype figure, due for release next year (2010). The Dare figure is just the start of a full Dan Dare range from Day2Day, also known for their Flash Gordon, Buck Rogers and Sinbad ranges. The quality of their figures is impressive and we're looking forward to seeing how the project develops. The latest issues of DC Thomson's Commando went on sale a day early this week as we bid goodbye to 2009. There's also some advance news for the next round of issues on sale in January 2010. "We'll be starting the year by re-issuing the first book featuring an Ian Kennedy cover by way of thanking the man for 40 years of sterling service to Commando," says editor Calum Laird. "The book is No 453 from 1970, and is titled Seek and Strike." downthetubes hopes to pay its own tribute to Mr Kennedy's stirling service to Commando and comics in the new year, but in the mean time, check out these interviews with the artist in conversation with Chris Weston and Terry O'Donnell. Commando No 4255 (previously No 2608 from 1992): Never Volunteer! The Dakota droned away and the canopy cracked fully open above Bob Slade, a private in the Parachute Regiment. He adjusted his rigging lines and took a quick glance at the barren desert wastes below. Unlike his mates descending all around him, Bob had been here in North Africa before — as a soldier in the French Foreign Legion, charged with the murder of an officer. And he knew as well as every other Legionnaire that the Legion never forgets... nor forgives! Commando No 4256 (previously No 2618 from 1992): Battling Rust-Bucket! The Duchess of Alna was a pleasure boat by trade, more suited to ferrying holiday-makers than going to war. Yet that’s exactly what she had done in 1940, as one of the heroic "Little Boats" of the Dunkirk Evacuation. And now, more than 50 years later, when some said that she was only fit for scrap, this unlikely battleship was off to the rescue again — slap in the middle of a war-zone! Gordon Livingstone (now retired) and Jeff Bevan were both staff artists on Commando when this book was first published. Jeff’s work was seen throughout the Boys' Papers but Gordon was almost exclusively a Commando artist, taking an average of four weeks to illustrate a complete book. The two new stories on sale this month are both set in the Ardennes, marking 65 years this month that the Battle of the Bulge was fought there. The Winter Warriors is the last new book drawn by the late Ricardo Garijo, completed before Need To Know but held over for the Ardennes connection. The Ardennes, December 1944. In the murderous confusion of what became known as "The Battle Of The Bulge", Allied soldiers warily stalked the frozen wastes and eerie forests of the battlefield, aware that at any moment they could be cut down by enemy gunfire. Not to mention marauding Nazi panzers or the terrors of hidden minefields. Commando No 4258: Friends Or Foes? When the Germans launched their Ardennes offensive — the desperate last-ditch "Battle Of The Bulge" — in December 1944, they sewed seeds of confusion amongst their enemies by using special units dressed in Allied uniform. As we all slowly recover from the excesses of Christmas it seems an appropriate time to be looking at Cinebook's latest offering from their Pandora's Box series, Sloth. American Olympic sprinter Paris Troy has been the fastest man in the world over 100 metres since the Istanbul Olympics almost 10 years ago but an injury has left his record vulnerable to the younger sprinter Ace Achean. However the rivalry between the two men goes deeper since Achean's supermodel girlfriend Helen had left him for Paris. With Achean closing in on his record and with his recovery from injury not happening as quickly as he would like, Paris' brother Hector, a former sprinter who is a convicted drugs cheat, suggests he meet with a doctor who is prepared to prescribe something that will help him. Is Paris prepared to use the slothful way of cheating to return to his world beating fitness? The Pandora's Box series from Cinebook is a set of eight books all written by the same author, Alcante, with seven different artists covering each of the seven deadly sins plus an eighth book, Hope, with art from the artist for the first book as a finale. 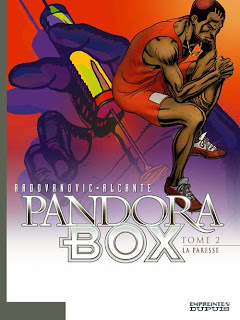 Sloth is the second book in the series with art by Vujadin Radovanovic which was originally published in French by Dupuis in 2005 as Pandora Box 2: La Paresse. As the names of the characters suggest, Alcante uses classical mythology as the basis for his characters - Paris stole away the beautiful Helen from the King of Sparta starting the 10 year siege of the city of Troy which ended with the deception of the Trojan Horse - while setting his story in the modern day. While not a plot point, the Trojan Horse itself does make an appearance as a tourist attraction in Istanbul, the best known Turkish city close to the modern day ruins of the city of Troy. While the book's characters are not quite faithful to those from the Trojan War, Helen is barely mentioned for instance, those readers with a classical education will be intrigued as to who Alcante introduces next in the plot and will also get a good indication of the climax of the story when they see that the doctor willing to prescribe the doping drugs to Paris is called Philoctetes. Radovanovic's art is adequate for the job but doesn't sparkle and while Alcante's plotting is interesting, as he interweaves his story with the Trojan myth, his characters are ultimately unsympathetic and in the end I was left disinterested as to whether Paris decides to take the drugs or not. Indeed the last couple of pages of seemingly tacked on epilogue just appear to push the drugs message too far. Of course since the Pandora's Box series is individual and unconnected stories with different artists this doesn't mean that the next title, Gluttony, due in February 2010 can fully be judged on the basis of this one. Pandora's Box is an interesting idea that Sloth just doesn't quite pull off. There are more details of Pandora's Box: Sloth on the Cinebook website. There are more details about the original publications of Pandora's Box on the Dupuis Pandora Box website. Well hopefully Santa arrived at your house last night and didn't look too much like this. 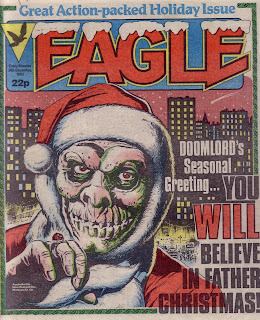 New Eagle's most popular character was of course Dan Dare but its most popular new character was Doomlord. The alien Doomlord Vek from the planet Nox created and written by Alan Grant was originally an evil character out to destroy the Earth but eventually became its protector. It this issue he takes on the disguise of Santa to hide from the Deathlords of Nox who are on Earth to kill him. The issue also included Dan Dare fighting for his life on the planet Belendotor, cop One Eyed Jack fighting for his life on the streets of New York and heavyweight boxer Danny Pike fighting in a European Championship eliminator in Madrid. 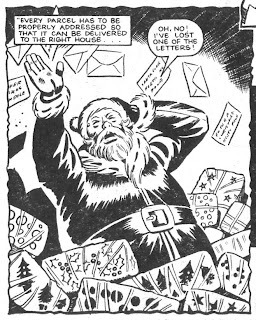 Christmas was also a theme in the issue's Amstor Computer story. The Amstor Computer stories were one off stories based on suggestions sent in by readers and "A Modern Christmas..." was suggested by Daniel Stockman of Middlesex. Artist Ron Turner shows that even Father Christmas needs a little help from modern technology. And so we leave our Christmas covers for yet another year and but not before we take the time to wish all our readers a Merry Christmas. Our run of Christmas covers continue as we countdown to Christmas Day. 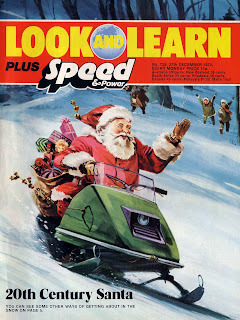 Christmas wouldn't be Christmas without a good Look and Learn Santa cover and this one comes from issue 728 in 1975. With Santa speeding over the snow on a snowmobile it is advertising the Speed and Power article "Skimming Over The Snow When It's Forty Below" which highlights snowmobiles, Sno-Cat tractors, the unpowered Sno-Bob as well as of course husky powered sleighs. The rest of the issue pretty much ignores Christmas with articles on General Montgomery's double, Clifton James, how a telephone works and the mud left behind when the Nile floods. The comic strips were the B&W Oliver Twist and of course More Adventures Of The Trigan Empire in full Don Laurence colour. 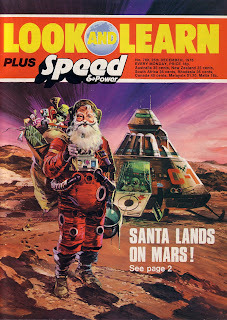 The following year, for issue 780, it was less 20th Century Santa and more a case of 21st Century Santa as Gerry Wood painted this amusing image of Santa on the surface of Mars. For someone able to visit every child on Earth in one night a quick detour to Mars doesn't hold many problems such as breathing the thin Martian air without a helmet on or, even more importantly, how he gets that beard into the helmet in the first place. This advertised the second of a Speed and Power series entitled "Exploring Space" which included an illustration of the same Martian lander with rather more realistic astronauts surrounding it. Trigan Empire had moved into the hands of Oliver Frey by this issue and the B&W strip was Great Expectations. Let's hope when Santa visits your house tonight his bag is as full as it is shown in these covers. Our final Christmas cover will appear tomorrow. DC Comics imprint Vertigo has announced new, re-mastered editions of Neil Gaiman's critically-acclaimed series, Sandman. Beginning next year, Vertigo will publish new trade paperback editions of Sandman in ten volumes - remastered and corrected versions of the comic the Los Angeles Times Magazine called “the greatest epic in the history of comic books,” featuring newly designed covers using Dave McKean’s spectacular and innovative art. The series was initially re-coloured for the four oversized Absolute Sandman editions. Vertigo previewed the covers of the first two volumes - Preludes and Nocturnes and The Doll's House - on its Graphic Content blog. There wasn't much Christmas cheer on display on the Christmas cover for Bunty in 1987. Indeed it seemed to be all doom and gloom - a miserable Christmas for The Kids Of Hunger House, a cold Christmas in School's Out and tears at Christmas in The Four Mary's. 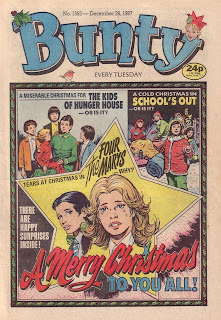 After Ian Kennedy's full colour IPC Fleetway cover of Super Naturals 1987 Christmas issue yesterday, he returns to DC Thomson's limited colour newsprint for this compilation cover for Bunty in the same year. The tears are not from one of the four Mary's - Field, Cotter, Simpson and Radleigh, but rather for one of their friends, Denise Fowlds, who is feeling sorry for herself since her divorced mother is in hospital and she has fallen out with her sister who has sided with their father. Set in the past, Hunger House is Conwyn Castle stately home where the bereaved master of the house is such a miser that he doesn't feed his children properly. But all is not lost as finding and reading his late wife's diary brings him to his senses in time for Christmas dinner. School's Out has four pupils of Wansdale School - Carol, Dawn, Marie and Ellie, queuing in the snow for the New Year Sales. So really they only have themselves to blame if they have a cold Christmas. Back in 2008, during the publication run of Captain Britain and MI13 by Marvel Comics, downthetubes regular contributor and Judge Dredd: The Megazine feature writer Matt Badham conducted an interview with novelist, comics and TV writer Paul Cornell, as research material for an article about Captain Britain that subsequently appeared in the the Megazine. Although various quotes were used in the Meg, and a highly edited version did previously appear in Tripwire, downthetubes is pleased to now present a full version of the interview, recorded during Captain Britain and MI13's run and before its cancellation. It offers a fascinating insight into Paul's approach to writing (and indeed, re-inventing) Captain Britain for the 21st Century - while building on the work of many creators before him. "Alan Moore and Alan Davis do loom hugely over the title," says Paul, also paying tribute to the work of original Captain Britain Weekly artist Herb Trimpe back in the 1970s, and other writers such as Dave Thorpe. "So much so that the only thing to do when I took over was to move it out of their sphere of influence, because a character that is being influenced by previous versions to an undue degree is not a living character. "I tried to do what I think Ed Brubaker has done spectacularly on Captain America, which is to find what would work for the character now and move it out of the shadow of previous interpretations..."
• Talking of digital comics, Insomnia Publications is one of a handful of UK comic publishers featuring on the launch offering for the PlayStation Network's Digital Comics service, which enables you to download the comics directly to your PSP over Wi-Fi or you use your PC to transfer the files. Although there's bound to be more coverage of both Marvel and Disney's offerings on the platform, this is a major coup for the independent publisher: titles on offer include Cancertown Burke and Hare, Cages and more. 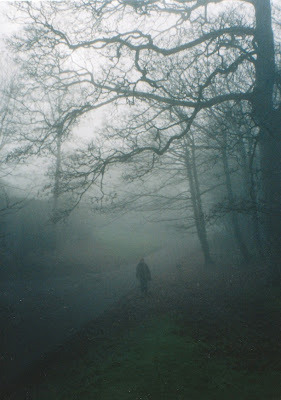 (Click here for a full list of titles on offer on the Insomnia blog). The service is also being supported by IDW Publishing and iVerse Media, among others and over 550 comics were made available at launch with more to be added as the service develops. • Forbidden Planet International reports that audio recordings from the Women in Comics conference, which took place a few weeks ago in Cambridge, are now available on the New Hall Art Collection site, including Sarah McIntyre, Asia Alfasi, Nicola Streeten and others, with more audio to follow in due course. • Matthew Badham has re-posted an interview with comic creators Adam Cadwell (left, as visualised by cartoonist Marc Ellerby) and Jim Medway that disappeared into the ether when his previous blog bit the dust. Matthew sasy both Adam and Jim say a lot of interesting things about comics and art, and make some good observations about the Brit' small press scene, as well as offering their insight into the failure of The DFC and much more. Jim, it seems, by the way, has a phobia about comic shops, arguing many are "awful" (with some notable exceptions, such as Nottingham's Page 45. "You can’t expect anyone else to go into a shop with goblins on the window," he feels. • Marvel Digital Comics Unlimited is to give away 1,000 free one-year subscriptions of its digital comics to enlisted US military personnel from Monday through 7th January. Air Force Times reports the offer is on a first come, first served basis. A year’s online subscription would normally cost $59.88, she said. Enlisted personnel who want to sign up for the free subscription can send an e-mail to marveldigitalpromo@sunbeltfs.com to receive a promotion code. • And finally... as you've noticed, Jeremy Briggs is once again plunging us back into British comics history with various Christmas covers here on downthetubes - expect one post a day in the run up to the Big Day - and Lew Stringer is also offering his annual Christmas comics posting, which started with a Valiant and TV21 cover and will focus on just four comics in depth this year. It's a real treat to see Leo Baxendale’s ‘The Swots And The Blots’ once again. View all Lew's posts over on Blimey! It’s Another Blog About Comics. "Merry Christmas, Mortals!" Does anyone actually remember this short run, toy tie-in title from Christmas 1987? 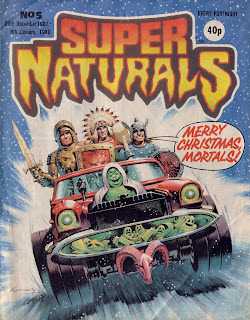 Ian Kennedy does his typically superlative full colour cover for the fifth Super Naturals comic based on the range of action figures that were produced, not by Palitoy or Mattel, but by Tonka - which rather explains why they were riding around in what looks like a Big Foot-style pickup truck called the Ghost Finder. The toys included holograms which changed with the viewing angle and featured broadly drawn characters. The three standing up at the back of the truck are the knight Lionheart, the American Indian Eagle Eye and the Viking Thunder Bolt. There are more details of the Super Naturals toys on the Action Figure Archive. Smart Bomb is a brand new all ages anthology that fuses computer game geekiness with comic-style nerdiness. You can be forgiven for thinking that crossbreeding geeks with nerds might result in some sort of slack-jawed dribbling one-eyed mutant of a comic, with acne encrusted pages. But no! Somehow editor Wil Overton has managed to create something quite beautiful (this statement should in no way be viewed as an endorsement for comic nerds and computer geeks to breed). The presentation throughout Smart Bomb is faultless, containing a puzzles page, pull out poster, free giveaway Super Action Battle Hack cards (which successfully satirise the Battle Cards genre, by being overly complex and impossible to play), and a crazy intergalactic furball editor named Kosmikat! At times, it’s almost like reading a professional comic. Although there’s only four strips inside Smart Bomb, the artwork throughout is crisp and clear, ranging from the near animation-cell quality of Phillip M. Jackson’s ‘Clean Up’ (a brilliantly written tale about two FBI agents who don’t quite have the alien situation under control as well as they’d like to think they do) to the gorgeously painted fantasy artwork of Eddie Sharam’s Double Dragon (in which a T-rex faces off against a Medieval Dragon. Brilliant!). Wil Overton’s ‘Pulsar Crash’ relied a bit too much on gamer lingo for my liking, though the ‘funny animal’ character in the strip was likeable enough and the cartoon artwork of a high standard. Ryan Stevenson’s ‘Galactic Libre and the Soul Of Mars’ gave me fond memories of the gritty comic strips that used to run in C and VG magazine, with its moody artwork and claustrophobic ‘Dead Space’ atmosphere. All in all, a bloody impressive first issue, especially from a bunch of largely unknown contributors who are all talented individuals in their own right. Judging by the preview page of what’s to come, we can expect a similar high standard next issue. So keep your eyes peeled for Smart Bomb Level 1-2, when the comic advances to the next stage! • Smart Bomb Level 1-1 is £4.00, full colour, 44 pages, and available to buy from: www.dinkybox.co.uk/smartbomb and and from indyplanet (in the US). Long-running football strip Striker is set to return - this time as a weekly strip in an as yet unnamed magazine. A Striker movie is also again in development. Announcing the return on the official Striker forum (membership required to view link), creator Pete Nash told fans of the strip, which reached the end of its run in British national newspaper The Sun earlier this year, that the strip looked likely to resume towards the end of January. "It will be one page in a weekly mag but as I've said before, I can't mention [its name] until the contract's been signed and both parties have agreed to it being made public," he said. Although the strip reached a natural conclusion in the The Sun, the new home for the strip will feature all-new adventures from Warbury. "It will pick up from where it left off in The Sun but the beauty of it being one page a week is that it will give me the time to work on Striker the movie," says Pete. Striker remains one of few "3D" comics to have enjoyed ongoing success, both as a newspaper strip and, for a short time, as part of a weekly comic. Although it no longer features in The Sun it continues to enjoy a fan following and various tie-in projects are "in the works". 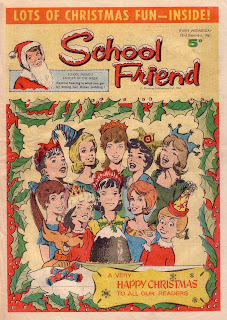 By far the oldest of our Christmas covers for this year, the girl's comic School Friend wished their readers "A Very Happy Christmas" in December 1962 with this compilation cover. School Friend began in May 1950 and ran for almost fifteen years until January 1965 when it was amalgamated into June. While the comic's best remembered strip was The Silent Three it does not feature in this issue. However this issue does have strips such as Sunny - The Girl With The Smiling Eyes, My School Friend Sara and the historical The Sign Of The Fish as well as a text story The Mystery Of Flint House by Jean Theydon. The Christmas issue continues beyond the front cover as most of the strips have a Christmas or winter theme to them. 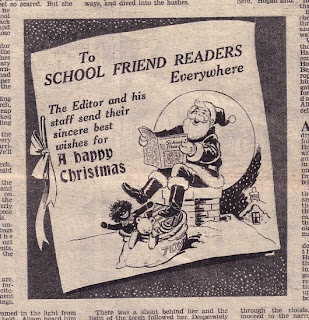 Included in the text story is this Christmas message from the editor which shows the age of the title as included in the illustration of Santa reading a copy of the comic is a Golliwog toy. The other interesting thing about this illustration is the message is from "The Editor and his staff" when the letters page in this girl's comic is run by Sally Brooks of whom there are photographs. I wonder if that caused any confusion amongst the comics readers back then? DC Thomson's humour comics can always be relied on to do Christmas issues. Christmas 1984 brought these offerings from the digest sized Beano Comic Library. 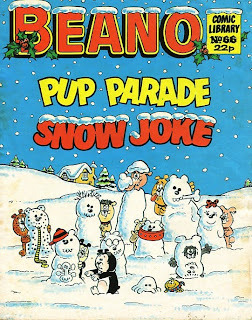 Pup Parade are the Bash Street Kids' dogs, each with the appropriate attributes of their owners, and in issue 66, Snow Joke, they were out to perform their own winter Olympics with sledging, skiing and ice skating. Indeed the story shows its age by including a reference to Torvil and Dean's Bolero ice skating routine. 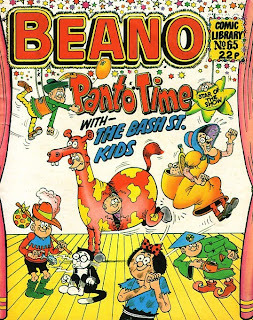 Meanwhile issue 65 had the Bash Street Kids themselves staring in Panto Time. After much initial to-do in which it only takes seven panels before Teacher's cane is produced, they choose to put on Cinderella, not that you can really tell from the front cover, and the expected chaos ensues. As the 25th of December rapidly bears down on us, each day for the next week downthetubes will be taking a look at a selection of comics and magazines from past Christmases. Speed and Power was Look and Learn's sibling, using much the same format but leaning more towards the technological than its older brother. It lasted for 87 issues from March 1974 to November 1975 before being amalgamated into Look and Learn, initially as a separate pull out section. The end of 1974 saw this unusual 48 page magazine format Christmas Special which they tried their best to give a Christmas cover to. Indeed each of the three subjects that artist Wilf Hardy illustrates are included in the contents - from the (sort of Christmassy) snowmobile racing to the RAF's then new Hawk trainer aircraft to the Soviet rocket launching a Mars probe. 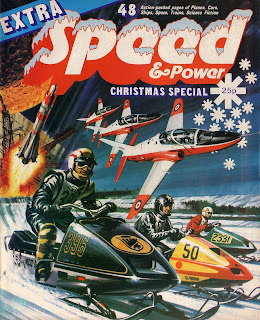 The Christmas Special was as close as Speed and Power got to an annual during its lifetime although three Look and Learn Books of Speed and Power appeared after the two titles were amalgamated. As for the weekly magazine the Christmas issue was hardly that Christmassy with a half hearted attempt at putting some holly and a "Happy Christmas!" 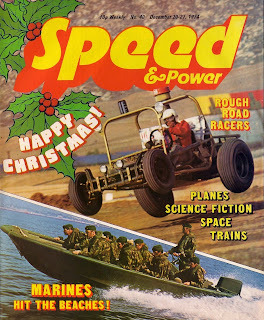 on the front cover which featured a less than wintry dune buggy racer and a Royal Marines Commando Dory rigid raider. In the last of this month's shows looking at the use of comics in education, the Strip! radio show, broadcast on Resonance FM and now available as a podcast, have interviews with a variety of practitioners and tutors with an interest in the subject. Sarah Lightman visits the Eastside Educational Trust in Hackney and talks to two of the tutors / mentors from the organisation - Rakhee Jasani and Truly Johnston - who have set up a project called 'Graphic Truths' as a way of engaging young people with comic book creation to tell stories that are personal to them. Sarah also talks to four of the young creators - Chantelle, Shantel, Leke and Nickita - who have worked on the project and are seeing their comics printed in an anthology called Tales of Diversity being launched next month. Also, Alex Fitch talks to V for Vendetta illustrator David Lloyd and cartoonist Steve Marchant about the project Cartoon Classroom they've set up with the help of Paul Gravett; a not-for-profit website that aims to inspire the next generation of cartoonists and make the art form more accessible to children and adults who want to be more proficient at creating comic-strips and drawing cartoons. www.cartoonclassroom.co.uk is also designed as a gateway and information resource for studying cartoon and sequential art in schools, colleges, libraries and museums across the UK and Ireland. • A slew of updates from ever busy comics artist Mike Collins, which are mostly Doctor Who related, including an original graphic novel for BBC Books, and drawing Matt Smith's debut for Doctor Who Magazine. Mike also some GI Joe stuff for Panini that's just come out with Gary Erskine on inks. "He did a fab job!," enthuses Mike. "Kev Hopgood did some too -- it was like slipping back two decades...."
• Omnivistacope cover artist Paul McCaffrey is currently working on a strip for IDW, Masques, to run in Zombies Vs Robots: Adventure #1-4. Check out his work at: www.coroflot.com/paul_mccaffrey. • Harker creators Roger Gibson and Vincent Danks are official guests at Hi-Ex comic convention, Eden Court, Inverness, on 27th-28th March. Find out more here. • Martin Conaghan and artist Will Pickering will be appearing at Forbidden Planet Edinburgh on Thursday 28 January 2010 from 4.30-5.30pm to sign copies of their graphic novel, Burke & Hare. • Rainbow Orchid creator Garen Ewing has cut prices of his signed and sketched-in books, as well as t-shirts, by £4 for the duration of December 2009. See the shop page here. The latest issue of Eagle Times (Vol 22 No 4, Winter 2009) is now available from the Eagle Society, wrapped in this cheery winter scene that illustrated an article titled 'He wants to be a Postman' from the Christmas issue of Eagle published in 1956 (Volume 7 No 52). Christmas Eagles - a look at Christmas issues of Eagle, its some of its companion and rival papers. 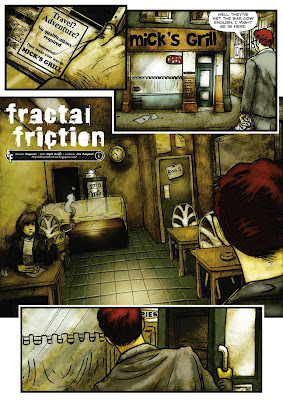 A number of long-time fans of 2000AD have banded together to launch Fractal Friction, an online collaborative storytelling venture, a story that starts when a man turns up for a job interview only for it to lead to something altogether stranger. Co-ordinated by the mysteriously-monikered Emperor, there are some great artists involved, all regular contributors to many UK indie press titles, including Matt Soffe , James Corcoran, Kevin Levell, Conor Boyle, and Chris Askham, the project given a more uniform feel with lettering by Jim Campbell. "The common thread is that we all read 2000AD and have been known to frequent the official forum," explains the Emperor of the project, "where a lot of the artistically inclined take part in the competitions (and generally help each other out in the creators forum). A number of us also contribute to the small press: Chris has a long history of work on FutureQuake Press titles and he, Kev and I are all in the latest Zarjaz and Kev, Matt and... me again are in the current Dogbreath. "Jim is the old, seasoned, pro keeping us all in line, having written the Warhammer 40k story Daemonifuge and the Dredd-world tale The Inspectre... and with his lettering cropping up all over the place. He isn't a shabby artist either, so he could really be doing this as a one-man show if I hadn't wedged a spoon into his cerebellum." The Emperor says he is "operating in a scripting support role, ready to give as much or as little as is required." A number of the contributors had been thining about doing a collaborative comic for some time, inspired by the success of such things as Huzzah. "We'd thrown out such an idea on the 2000AD forum," the Emperor continues, "So I was obviously up for the challenge but how to start? "Matt suggested I dust off an old story idea but that didn't narrow it down as I've got a tonne of them sitting around (even if a reasonable proportion are fit only for the budgie cage). I did have a nose through them though, and found one idea I'd come back to a couple of times but it had never got beyond the introduction. The basic premise was: a young lad turns up for a job interview and ends up being catapulted right off the map. The first iteration of this idea, gave us the name "Fractal Friction," although the story and reason for the name will remain a mystery for now, as there is a possibility we will delve into that further down the line. "The second shot at the story is pretty much what you see, just with a little back and forth first helping firm up the characters and the larger backstory. So once this was given a provisional thumbs up, I hammered out the 40 panels-worth of introduction (as it was pretty clear in my head by now) which, the way it has been divided up, runs to the first nine pages." And then beyond that... what? "Well, that's all up in the air and is where the fun really starts!" says the Emperor. "I'm happy to step back and let the artists take it from there, seeing where the story takes them... Beyond page 9 it is all up to the artists and whatever approach they prefer: I can leave them to it and cheer them on from the sidelines or I can offer advice when required or do some heavy to light plotting Marvel Method-style or I am up for just adding the words to the pictures or I might be called upon to provide more script. "We'll have to play it by ear, but I'm up for any challenge and it'll be fun seeing where it goes. • If you're a writer or artist interested in getting involved in later developments for the project, email the Fractal Friction team (or drop them a note on the 2000AD forum). We plugged the Mirabilis team's free-to-download Year of Wonders PDF comic just yesterday, but we're so knocked out by the Henry James-styled Christmas ghost story that we're urging you all to head over and grab your own copy - described as a "work in progress" - as soon as possible. It's just fab. "Christmas Eve in particular is a time when the world holds its breath, the pulse of time fluttering to nothing for an instant before it begins again," says Dave Morris in his introduction to the tale. "Could there be a more appropriate time to settle down with a tale to send shivers up your spine?" “A Wrong Turning” is one of half a dozen self-contained seasonal stories originally written to promote Mirabilis, a strip which fisrt saw light in the weekly The DFC comic from Random House and is now enjoying a new life online. There’s nothing about the story that marks it as being set in the Mirabilis universe, however. A bereaved father and son take a detour that leads them into an eerie encounter with the next world. The tight, atmospheric pencils are by Martin McKenna, and you’ll see right away why he is so in demand for movie storyboarding, his art style evocative of the likes of great Creepy artists like Gray Morrow, Reed Crandall, Angelo Torres and Al Williamson. You’ll find the PDF of “A Wrong Turning” here. "Go ahead, it’s our Christmas present to you," urges Dave. "All we ask is that, if you enjoy it, please send it to at least two friends who you think might like it, and ask them to do the same. If you have a blog or a website whose readers might appreciate a little scare, by all means feel free to put it up there too. "2010 is the year we’re planning to embrace viral marketing, and we mean to hit the ground running." 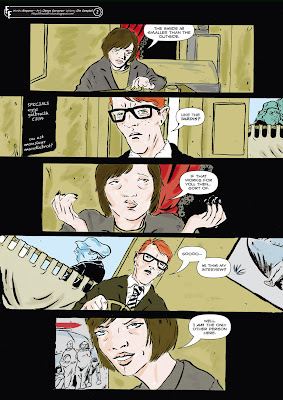 In May, SciFiPulse Radio took its first steps into Brit Comics with two cracking interviews with Martin Conaghan, writer of Insomnia Publications' Burke & Hare, and Tony Lee, who talked about Markosia's From The Page’s Of Bram Stoker’s ‘Dracula’: Harker. "This was still early days for the radio show and was before it had established any sense of format," says Ian of these early forays into audio, pointing out he only began the podcast in March - although he's had something of a baptism of fire with the project with the occasional 'missing guest'. In July the podcast struck once again and produced a somewhat informal and comical interview with artist Simon Wyatt who is hard at work on his book Unbelievable for Insomnia Publications. In October, after having done a fairly strong interview with them on the scifipulse website, Ian opted to bring Peter David Douglas and Neil Van Antwerpen on to the radio show and sink his fangs into some of their thoughts about the work process then went through for Harker with Tony Lee. In November, just one week after interviewing Amanda Tapping of Stargate and Sanctuary fame, Ian took another step into the world of comics and spoke to Ian Sharman, owner of Orang Utan Publishing. Of course, it goes without saying that the British Comics business owes much to the talents of Bryan Talbot for bringing us the first official British Graphic Novel, The Adventures of Luther Arkwright, as well as Grandville. Ian caught up with him and managed to produce an insightful interview with the writer and artist, which was the first show to air in December. Although many interviews were done on the radio show in 2009. Ian still found time to post a few interviews at the main website, including an abbreviated version of the audio interview with Bryan here. Ian also spoke to publisher Harry Markos of Markosia Comics, and tells me has many more British comic creator interviews coming up, including Leigh Gallagher, artist for 2000AD and, sometime in the new year for the radio show, and is also planning a website Q&A with Dan Dare and Knights of Pendragon artist Gary Erskine. • You can download episodes of the radio show at www.blogtalkradio.com/scifipulse or through iTunes store by typing in scifipulse and clicking on subscribe. • Death's Head is back! And not some Johnny-Come-Lately Death's Head II or III, or even the bit-on-the-small-side Version I, the result of an encounter with the good Doctor and his TARDIS. No, Marvel's new S.W.O.R.D. title features everyone's favourite robot bounty hunter from his giant robot days, back when he could go a few rounds with a Transformer or two -- and indeed, did, before he was dropped into the Marvel Universe via Doctor Who Magazine. Written by Keiron Gillen, with art from Steven Sanders, the book's second issue, featuring a no-holds barred fisticuffs between Marvel UK's most memorable mechanoid and S.W.O.R.D's finest. Catch it via your local comic shop now. • Poot! Comic is back! This British humour comic was first published in the 1980s and 90s but has now been relaunched as a bi-monthly title. Issue number 2 is in the shops now: we'll have more about this soon, but in the mean time, check the comic's web site at www.pootcomic.com. • Anyone watching the Comedy Awards on ITV Sunday night may have noticed a superhero style to some of the set dressing around the room, including Alan Carr as "Chattyman". One of the contributors to this look was none other than Jon Haward, these days best known for his work for Classical Comics but who can clearly turn his hand to just about anything! "I was asked by the Production Designer Simon Kimmel to draw Mr Ross looking like a superhero," explains Jon. "The producers of the show liked my samples so I was given a contract to work on the show!" • If you want to dip back into Commando, why not give their Christmas competition to win collections of the comic?. Yes, some lucky person will win a (postman crippling) eight of Carlton's Commando reprint books in this competition being run on the official Commando website. Considering how big each book is that is a lot of reading for someone in the New Year! • downthetubes stalwart Matthew Badham has not only been busy in print, with a massive John Ridgway interview in the latest Judge Dredd: The Megazine: he's also just posted a 2008 archive interview with Si Spurrier on his own ace blog, talking about the much-missed Warhammer Monthly. Only a few select quotes from the interview were used in the Judge Dredd:The Megazine two years ago, and the longer interview offers much more information. • And finally for this Tube Surf - the creators of Mirabilis - one of the best unfinished strips in the much-missed subscription only comic The DFC - are offering a fantastic ghost story for Christmas: check it out on their web site. If you like it, please help us to spread the word! 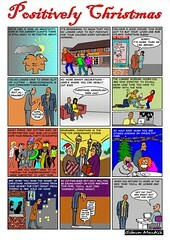 Compiled with thanks to Calum Laird, Jeremy Briggs and Sven the Sax! ILEX Books have given the green light to SciFi Art Now, a book project assembling outstanding examples of the very best in science fiction art, which is being edited by downthetubes webmaster John Freeman. John hopes plenty of illustrators from around the world from book, game, comics and other publishing fields will want to have a sample of their work considered for the final book. "We want the book to feature the very best samples from both new and established illustrators," he says. Editorially, ILEX, well known for their huge range of art books including Comic Art Now , edited by Dez Skinn and Fantasy Art Now by Martin McKenna, would prefer to see more aliens and human SF visuals -- strong, inspiring characters from modern SF -- rather than spaceships and alien vistas, although there will be space for those too. It's worth checking out the Amazon links above to both books as both catalogue entires offer a 'look inside' feature which will give you an indication of the kind of standard of work that has been featured in the past. Samples will be needed by 8th January 2010 if possible. "ILEX tell me contributors to the other books in the series have secured work as a result of being in the collections," says John, "which I hope is incentive to artists to get involved." Yes - a new Really Heavy Greatcoat! Longtime downthetubes readers will know the Greatcoat strip was the joint creation of myself and Nick Miller back in 1987 (more info here), but what with other work commitments and the assumed demise of Comics International, where it was last appearing (the publisher now appears to be ignoring our emails for confirmation of this), the strip has taken a back seat to other things for the moment. A film adaptation of the life of Christ inspired by The Road of Courage, a strip that first appeared in Eagle in the 1960s, is apparently in production. Re-titled Jerusalem A.D., the project, based on the illustrations of Frank Hampson, was announced back in March but seems to only have been picked up by religious newspapers such as the Baptist Times. The film, to be made by Bill Melandez Productions Inc (BMPI), the animator of the Charlie Brown and Snoopy cartoon series, is described as "a filmic adaptation of the life of Christ inspired by the original illustrations from the ‘Road of Courage’ by Frank Hampson from the seminal sixties comic The Eagle." The project - one of several from BMPI announced back in March which also include an adaptation of illustrator Michael Foreman's Cat in the Manger, the story of the birth of Jesus Christ in Bethlehem, as seen through the eyes of a cat - is a co-production with the Alliance for Christian Media. Frank Hampson devised The Eagle in collaboration with the Reverend Marcus Morris after the Second World War and it's no secret Morris, who went on to edit womens' magazines such as Cosmopolitan, intended the comic as a Christian antidote to what he saw as the bad influence of American comics during the post-war period. The Road of Courage, which was written by Marcus Morris, was a number of "True Life" stories that featured in the comic and a 1980s collection of the strip is a much sought-after collectable, copies often fetching high prices on auction sites like eBay. A new collection will be published by Titan Books Titan Books in March next year, featuring not only Road of Courage but another story based on the New Testament, 'Mark, the Youngest Disciple', written by another early Eagle contributor Chad Varah and drawn by Giorgio Bellavitis, who sadly died fairly recently. The Alliance for Christian Media is a US organisation in the US promoting the Gospel through existing and emerging communication technology. The multi Emmy Award-winning Bill Melendez Productions Inc was founded in 1964 by legendary animator, director, and producer Bill Melendez who originally worked as an animator on Bambi, Fantasia and Dumbo for Walt Disney and was chosen by Schulz creator of Charlie Brown and Snoopy to be the sole animator for his celebrated cartoon series. Other productions included The Lion, the Witch, and the Wardrobe for Children’s Television Workshop. Although Bill Melendez died last year aged 91, his son Steven Melendez has been President of BMPI since 2002. At the end of the 19th Century our intrepid reporter heroes − Fred “Ferret” McGlone, Harry Hornby and Digby Bolton − are in the front line once again. This time they are caught up in the blood-soaked action of the Boxer Rebellion in Peking. As British troops fight alongside those of several other nations to quell the brutal uprising, fellow newshounds Charles Black and Ned Bly uncover a plot to misinform the Western world about what’s really happening in China. Would they and their despatches ever reach home? After being wounded on the Western Front, Captain Peter Laine was posted as a military observer to Finland, a country in turmoil in the aftermath of the Russian Revolution in 1917. Some Finns − the Reds − were on the side of the Russians, while the Whites opposed these Bolsheviks. When Helsinki was overrun by the Russians, Peter decided that he could no longer only observe. Would he survive THE COLDEST WAR? Sixteen-year-old Max Grainer worshipped his brother Walther, a hero on the Eastern Front. He couldn’t wait to get into action himself and join Walther in the fight for glory. Commando 4254: Kill the Fuhrer! It was 1945 but still the war dragged on as Adolf Hitler tightened his grip on his ever-shrinking Nazi empire. Only his death could bring peace to war-torn Europe. Which is why, one cold February morning, Squadron-Leader Kenny Campbell led a Mosquito squadron a very special mission − to KILL THE FUHRER! Collectors may like to get hold of these issues as DC Thomson are running a subscriptions offer that offers a gift of five archive issues to anyone taking out a subscription to Commando. Two packs are offered, one from the 1970s, one from the 1980s. The only problem is... which to choose! The next batch of Commandos following these will go on sale one day early, on 30th December. They will be No 4255 Never Volunteer! (originally No 2608 from 1992); No 4256 Battling Rustbucket! (originally No 2618 from 1992); No 4257 The Winter Warriors; and No 4258 Friends or Foes? What It Is: Not to be confused with the Egmont WH Smiths special released recently, this is an entirely new fan-produced title published by the official Misty web site, comprising all-new strips by a wide range of creators including 2000AD artist SMS, who provides the cover, Dave Roach, Mike Nicoll, Terry Wiley and many others. The Review by Paul Harrison-Davies: It's immediately obvious that this Misty Special is a labour of love: it's such a well put together comic with colour interiors and a fantastic cover. The trouble with small press/independent anthologies is that they are often a mixed bag when it comes to ability, and that's the case with Misty. Yet it hardly seems fair to judge some creators harshly against others, and I found that Misty had enough heart and soul to gloss over any of the hiccups of creators with less experience than others. In fact, without naming names, I found that although the writing of one author seemed the least professional it was more than made up for by the emotion of the script, and actually felt like the most 'Misty' of all the stories. Great work from the always excellent Terry Wiley, a change of pace from the shiny colour work of Ex Astris from Mike Nicoll and some lovely artwork from J.P. Sewell were the stand outs for me, with downthetubes very own John Freeman and someone simply called 'Amelia' providing scripts for a couple for my favourite strips: 'Time School', 'Dreamcatching' and 'A Waltz Out of Time'. All told, there was only a few strips that just didn't grab me, and that's not bad for a comic that feature sixteen tales and a great interview with original Misty artist John Armstrong, who also provides a 'Bella' poster for buyers of the Special. Unfortunately, the Misty Special is not cheap. I can understand why it's priced highly, but I think that it may put many possible readers off. Also, it just didn't feel like a 1970s/80s comic, possibly due to the glossy paper and use of colour. I'd have rather seen something that more directly tried to emulate the look and design of a comic of that time, maybe even down to artificially yellowing the pages. Still that's a personal preference, and obviously not one shared by the creators and publisher. Chances are if you were a fan of Misty, you'll be buying this, and I doubt you'll be disappointed. Time School - Teacher’s Pet! • Sottish artists co-operative blog Scotch Corner has launched a competition to get a Marvel character of your choice drawn by Tom Crielly. • Talking of competitions, artist Tim Perkins has launched a Christmas Manga Art Competition. The winner will have their work appear online here on the Wizards Keep News Pages, over on the Wizards Keep Blog and on the other Wizards Keep network places on the Internet, all 22, or so of them. • Arthur Ranson, well known to 2000AD readers for his work on strips such as Judge Anderson and Button Man, now has his own official web site (www.arthurranson.com), crammed with great examples of his art down the years. Arthur reports he has an exhibition coming up from 14th January at London’s Orbital Comics gallery and also reveals the Button Man movie is still in development hell, by al accounts. "Dreamworks have a few months to decide whether to either go ahead, pay for more time to decide, or drop it," he says, countering reports of some casting decisions elsewhere on the Internet. • Readers in and around Edinburgh might want to head along to Forbidden Planet there tomorrow evening, where bestselling author Ian Rankin will be signing copies of his comics debut Dark Entries from 5 to 7pm on our branch in Southbridge, just a haggis-toss from the Royal Mile, so please do come along (the event is free but ticketed, check with the branch to get hold of one, telephone 0131 558 8226). A second batch of David Lloyd V For Vendetta illustrations are now on eBay in support of the Cartoon Classroom project, which aims to serve libraries, schools, colleges and museums by directing them to creators who teach in these specialised areas via workshops and talks and to direct those who wish to find training in these areas for the wildest range of educational opportunities that can be found for them on a local and national basis. As we previously reported, artist David Lloyd originally put four V For Vendetta illustrations that he did at the opening night of the Comica Festival at the Institute of Contemporary Arts in London on Guy Fawkes night, 5th November 2009, onto eBay. These sold for over £400 in total. The four new illustrations can be seen here on eBay and the auctions are due to finish just before midnight on the evening of Sunday 13 December.